Former San Francisco 49ers quarterback Colin Kaepernick has signed a book deal estimated over $1 million, NBC Sports reported Tuesday. According to reports, the book will be published under One World, an imprint under Penguin Random House led by Chris Jackson. Jackson, one of only few black editors in the publishing industry, is known for his works with author Ta-Nehisi Coates, civil rights lawyer Bryan Stevenson, and hip-hop mogul Jay-Z. NBC News has reached out to Penguin Random House but has not received a response. 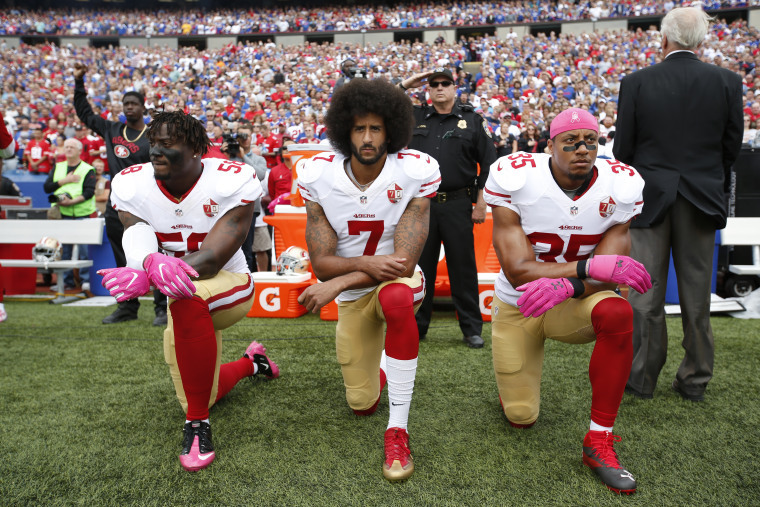 Kaepernick ignited a national conversation around police brutality in 2016 when he started kneeling during the national anthem as a form of protest. A year later and nearly three months into a new NFL season, he has yet to be signed by a team. His supporters and activists believe the NFL has "blackballed" Kaepernick for expressing his opinions and exercising his right to free speech. In August, crowds of people rallied outside of NFL headquarters to show their support for Colin Kaepernick. Without a NFL commitment this season, Kaepernick has had more time to further delve into his activism and work to mobilize communities. Kaepernick had previously been seen “taking meetings with publishers in the New York offices of WME” to pitch his highly anticipated book, Page Six reported.